Botswana headquartered Choppies Enterprises Ltd is an investment holding company listed on both Botswana Stock Exchange (BSE) and the Johannesburg Stock Exchange (JSE). Through its subsidiaries and associate companies, the Choppies group operates in the retail sector of the sub-Saharan African market. At present, the group operates in eight Sothern African countries (Botswana, South Africa, Zimbabwe, Zambia, Kenya, Tanzania, Mozambique and Namibia) and continue its expansion into new, as well as under-serviced areas in the existing markets. The group is managed by a team of over 300 professionals who has extensive expertise and experience in the retail industry. At present, the group has 218 stores across the southern African region. In 1986, Choppies commenced its operations with a single store in Botswana. 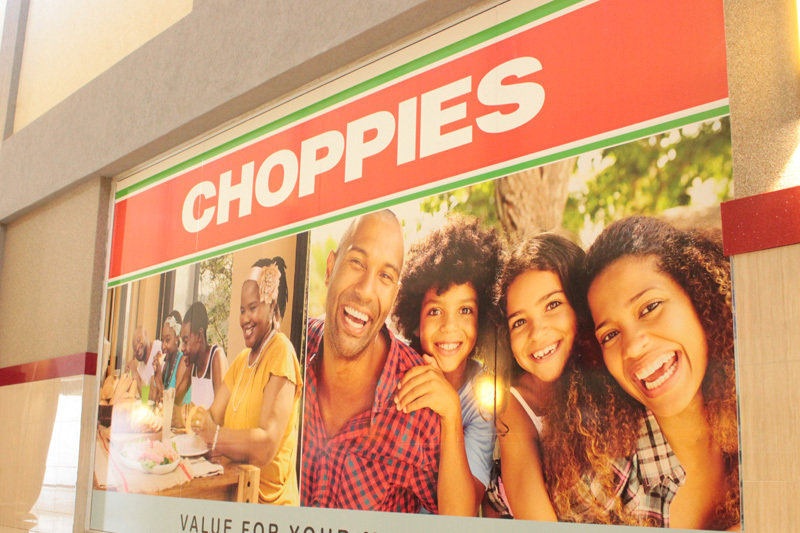 Over the past 31 years, Choppies has grown as a home brand in Botswana and spread its wings into seven other African nations and has become a significant retailer represented in the sub-Saharan African market. The Choppies group, managed through its Botswana and the rest of Africa divisions, is a food and general merchandise retailer, selling a vast range of products at a great value. The company always put customers at the heart of our business and treat them with great respect. Over 50% of Batswana shop regularly in our stores and we have some of the most loyal customers in the country. Choppies operates mainly in three retail formats- Hyper stores, Super Stores and Value Stores. The retail chin offers to customers mainly focuses on food and non-edible groceries, clothing, tobacco, beauty products and general merchandise. The offer also includes additional value added services such as financial transactions at the till points. In additions to manufacturer-branded products, Choppies has a number of its private label products to suit every budget. The group will soon be launching its online business which will give the customers the opportunity to shop from their homes and have their order delivered to their doors in a fixed time slots. The group has developed centralised distribution channels (CDC), in Botswana and South Africa and Zimbabwe with a strategic focus on accelerating the level of central supply in its business. At present, supply in Botswana is 60% centralised, while in South Africa and Zimbabwe it is 80%, 50% respectively. The group operates 5 distribution centres across the eight countries catering for groceries, fresh and perishable produce. With over 17,000 staff members, the Choppies Group is a significant employment generator in the retail sector in Africa. The Group will continue to address the socio-economic challenges faced by the communities it serves through the supply of high-quality, affordable food for all customers while providing significant employment and economic opportunities across its value chain. To: Be a strong responsive provider of consumer goods at affordable prices. Give customers the best value for their money. Bring products to semi- urban and rural areas. Generate sustainable economic development by supporting local businesses and farmers and core value creation in the society. Create new jobs and develop all employees to their highest potential and ensure proper skills transfer to the local workforce. To be the best service provider of FMCG in Sub-Saharan Africa.